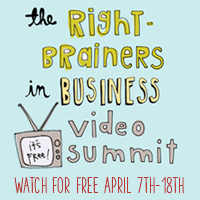 Did you know that the wildly popular Right-Brainers in Business Video Summit is back for it’s 4th year? If you’ve been with us before, you know how much learning and action happens during this innovative virtual event. If you’re new ’round these parts, I do hope you’ll join us live April 7th-18th. It’s FREE and it’s an amazing way to connect with thousands of creative entrepreneurs from around the world. PLUS this year we’re celebrating the launch of my 2nd book, Building Your Business the Right-Brain Way. Wooohooo! I can’t wait to share inside peeks into the book with you and highlight some of the latest teachings to help you grow your creative business. And even before it all begins in a few days I’ve got a special somethin’ for ya! When you grab your no-cost video summit ticket, you’ll instantly receive an audio download of a conversation with my business mentor Andrea J. Lee and me. 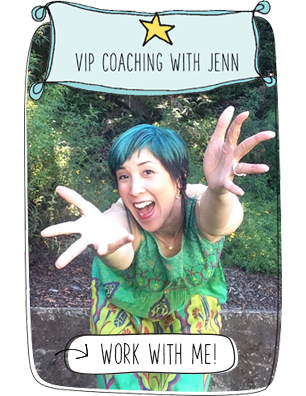 This exclusive info-packed interview is almost like eavesdropping in on one of our private coaching calls! Plus you’ll get healthy doses of expert teachings and case-studies, plus lots of laughs. We explore the 3 different phases of business growth and give you tips to identify where you are. Andrea even puts me in the hot seat a bit to look at my growth from 6-figures to multiple 6-figures. I ask Andrea about her latest venture into the non-profit foundation arm of her enterprise. You’ll be inspired by how her successful business has helped to free her up to contribute to a cause that has a special place in her heart. We right-brainers want to be making a difference in the world, right? Why it’s important to have strong pillars (a.k.a. moola-making methods) to support growth over the long-term. Some of our top secrets to sustainable success. Listen to our interview and then tweet your takeaways using the hashtags #rbbiz AND #jennandrea now through Sunday, April 6th. 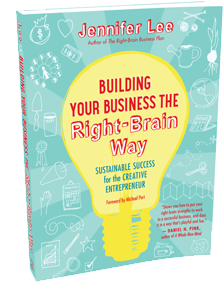 And you’ll be entered to win a bundle of Right-Brain Business goodies including a personally signed copy each of Building Your Business the Right-Brain Way and The Right-Brain Business Plan, plus my RBBP Kit, AND a Booster Pass to the Summit. Even before we dive into the creative feast that is the 10-day summit, you can whet your entrepreneurial appetite with this inspiring and informative interview. It’s yours to listen to again and again, no matter if you’re able to make it to the live event or not. So, make sure to grab your no-cost ticket today and get a head start on the summit wisdom by listening to your special instant bonus audio. I can’t wait to see you LIVE in a next week!